Advertiser.ie - Album review: R.E.M. 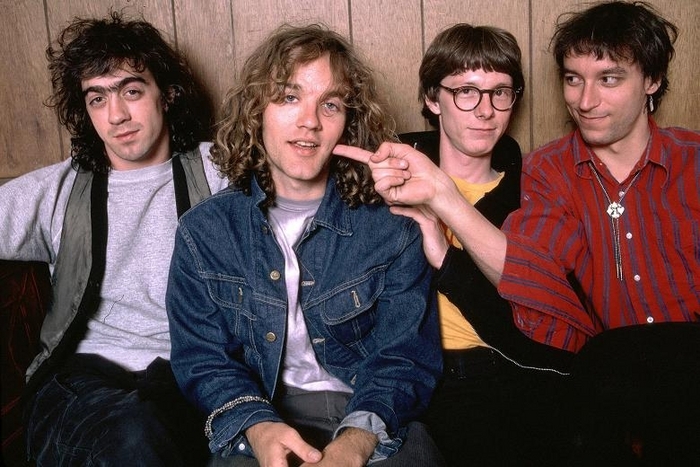 THERE ARE many who argue that R.E.M.’s greatest artistic achievements, bar 1992’s Automatic For The People, came during their time on the IRS label, before they signed to Warner in 1988. Adherents of this view will find further support for their case in 7IN - 83 - 88 which collects the 11 singles the Georgia band released in the eighties on IRS in the form of a boxed collection of vinyl 7” singles with replicated original sleeve art. It is a breathtaking run of singles, opening with the band’s debut and one of their absolute masterworks - the anthemic, urgent ‘Radio Free Europe’, continuing on through such songs as ‘So. Central Rain (I’m Sorry )’, ‘Don’t Go Back To Rockville’, ‘Driver 8’, the peerless ‘The One I Love’, and the frantic, inspired, ‘It’s The End Of The World As We Know It (And I Feel Fine )’. No excuse is ever needed to re-listen to these songs, but hearing them in the context of a sequence of singles shows that, not only were R.E.M. hitting the ground running with a purple patch, but they were also shaping the future of alternative rock. Like The Smiths in Britain, R.E.M. possessed a vocalist of charisma and intelligence; a gifted, original guitarist with a lightening fast right hand who could turn the most ordinary chord sequence into a breathtaking arpeggiated rush, and a rhythm section which gave weight and meat to the songs. Also like The Smiths, R.E.M. came from post-punk and melded that heritage with a love of folk and melodic sixties pop and folk rock, laying down the bedrock and guidelines of the nascent ikndie-rock movement. The singles though are familiar to any serious R.E.M. fan and have been anthologised numerous times, but the chance to own them on vinyl, alongside an array of gems scattered across the B-sides, make this a worthwhile investment for that selfsame serious fan. ‘Radio Free Europe’’s B-side is a cover of The Velvet Underground’s ‘There She Goes Again’ as perhaps The Byrds might have played it and allows itself to sound more sixties than ever the Velvets would have been comfortable with. ‘Catapult’, one of Murmur’s most underrated songs, is captured in concert, and while not the best recorded live track here, more than compensates with its energy and muscle. The cover of Pylon’s ‘Crazy’ was featured on 1987’s Dead Letter Box compilation, but bears repeated listening being more haunting and mysterious than the original. ‘Bandwagon’ and ‘Ages Of You’ are R.E.M. by numbers, but there is a warmth and melodicism that is hard to dislike. The true gems though are the in-concert recordings of ‘Maps and Legends’, stripped down to just vocals and acoustic guitar, and the hard-to-find ‘Time After Time/So. Central Rain (I’m Sorry )’, which begins with an audience member calling out for ‘Time After Time’ (bet it’s not Stephen Malkmus! ). Again, this is just Michael Stipe on vocals, sensitively accompanied only on guitar by Peter Buck. It is utterly transcendent and hauntingly beautiful - like much of R.E.M.’s finest workings from the period.